The summer months are the perfect time for your senior loved one to get some fresh air and head outdoors, which could lift his or her mood and provide an opportunity to socialize. 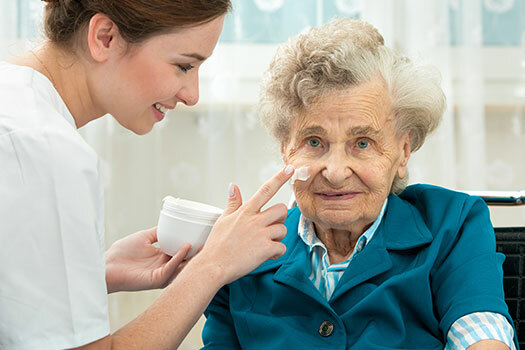 Aging skin loses some of its ability to protect itself against skin diseases, and being outdoors in the warm summer sun means special precautions need to be taken. Encourage your loved one to protect his or her skin this summer with these tips. Many seniors believe it’s not necessary to use sunscreen because melanoma (skin cancer) takes years to develop. However, this is not the case. With age, the ability of the body to repair damage in the DNA decreases, which means cancer cells can be formed more easily. Past DNA damage can also cause cancer to form. Your loved one needs to apply a generous layer of sunscreen 30 minutes before heading outdoors and before getting dressed to ensure no exposed skin is missed. The sunscreen should be reapplied every two hours while outdoors or more often if your loved one is swimming or sweating. If your senior loved one has been diagnosed with a serious condition and needs help with tasks like meal prep, transportation, bathing, and grooming, reach out to Home Care Assistance, a leading provider of home care Sacramento, CA, families can trust. We also offer comprehensive care for seniors with dementia, Alzheimer’s, and Parkinson’s. Many seniors have dry, itchy skin due to naturally losing oil, medications, and health conditions. Skin is approximately 64 percent water. When dehydrated from being out in the warm sun and sweating, the skin is one of the first areas to feel the effects, becoming increasingly dry and itchy. Bring plenty of water bottles in a cooler and encourage your loved one to drink water often while outdoors to stay hydrated and prevent dry skin. A professional caregiver can help your loved one stay hydrated during summertime. Whether your elderly loved one needs part-time assistance with basic household chores or you need a break from your caregiving duties, the Sacramento respite care experts at Home Care Assistance are here to help. All of our respite care services are backed with a 100% satisfaction guarantee, there are no hidden fees in our contracts, and we never ask our clients to sign long-term contracts. Even with sunscreen, your loved one should avoid being outdoors when the sun is at its strongest between 10am and 4pm. Ultraviolet rays do the most damage during this time, putting your loved one at risk of losing skin elasticity and developing skin cancer. Even when wearing sunscreen, it’s important to prevent too much skin from being exposed to the sun. With age comes a diminished ability to regulate body temperatures, which can result in becoming overheated by being in the sun too long. Light clothing such as a light jacket, a loose long-sleeved blouse, comfortable pants, and a light wide-brimmed hat can shield your loved one’s skin from the sun, preventing him or her from being uncomfortable and overheating. Sun and wind damage could leave your loved one’s lips burned, chafed, and chapped. Applying lip balm with an SPF of at least 15 and reapplying it throughout the day as needed can keep his or her lips soft and moist. Seniors who want to maintain their health during the extreme heat of summer should consider hiring a caregiver. In Sacramento, elderly care agencies can be a great boon to seniors. With the help of the caregivers at Home Care Assistance, your aging loved one can lead a happier and healthier life. We offer a revolutionary program called the Balanced Care Method, which encourages seniors to eat nutritious foods, exercise and socialize regularly, and focus on other lifestyle factors that increase life expectancy. Call us at 916.706.0169 to talk to one of our friendly Care Managers and set up a free consultation. Have Researchers Unlocked the Key to Anti-Aging? Are Dementia Symptoms More Severe in Spring? Is It Healthy for Older Adults to Drink Milk?